What’s the difference between fluid, fans and magnetic? How are turbo trainers are used? Who should buy what? All the answers are here. Turbo trainer is the name given to any stationary training device which a normal bike is placed on to simulate riding on the road. This obviously makes them ideal for training indoors when the weather is foul. They also allow for specific training sessions throughout the year. And the’re often used for warming up in the arena before a competitive race or time trial. Any rider can benefit from using a turbo trainer, not just racers. Over the winter the dark nights and bad weather can make it difficult to find the time or motivation to get out. Being able to do a couple of rides a week on a turbo can make a huge difference to your fitness and when the weather does improve you’re already in good shape. The basic principle is that the bike is connected to an A-frame via the rear axle and the rear wheel turns against a roller as you pedal. The roller is weighted and can offer various levels of resistance depending on the model. This method of resistance can be classified into three categories; fan, fluid and magnetic each with their own pros and cons. Most modern turbos offer different levels of resistance which can be controlled manually via a lever on the bars or electronically depending on model. The latest generation of turbos can even be linked to computers for a more realistic interactive workout, definitely less boring than just sitting looking at data during a session. A fan creates resistance as you pedal so the harder you pedal the more the fan resists but adjustability is limited to your gears. These are the simplest form of turbos but have fallen out of favour in recent times due to the lowering cost of magnetic trainers. A magnetic plate inside the roller’s resistance unit can be adjusted to offer different levels of resistance. This can be controlled manually by a lever on the bars or electronically on some models. They are pricier than fan versions but offer more adjustability and are much quieter. 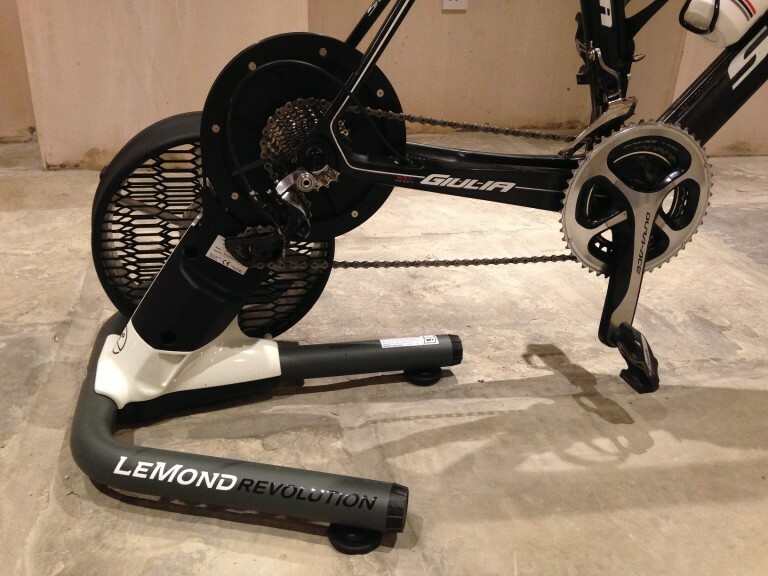 Example: Cycleops Mag Trainer with Remote. This type works via an impeller (basically a finned rotor) in a fluid-filled unit which increases the harder you pedal. Therefore increasing the amount of resistance with certain units allowing you to adjust this on the fly. Fluid trainers are very efficient and effective but also more expensive. They are the quietest though so if you don’t want to annoy the partner or neighbours and want a good workout these are the type for you. Example: Kurt Kinetic Road Machine 2. There are also two other types of stationary trainers which don’t fit the usual mould but are still often be referred to as turbos: Direct Drive and Rollers. These are the latest incarnation of trainers. These designs are where the rear wheel of the bike is removed and the bike’s chain is used on a cassette fitted to a resistance unit. The result means you can control resistance and gears for a better workout. This saves on tyre wear – turbos can ruin a tyre quite quickly. But the units can be expensive. 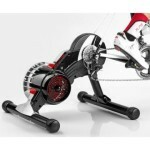 Example: Elite Turbo Muin cycle trainer. Rollers are exactly as they sound. The bike sits on a unit with three rollers at floor level – two at the rear wheel and one at the front. The front roller and the roller immediately in front of the rear wheel connected with a band. When the rear wheel turns it then also turns the front wheel giving a very realistic riding sensation as you have to concentrate to stay upright because the bike is freestanding. The only downside is the resistance cannot be controlled (well apart from some new models but they are very expensive). 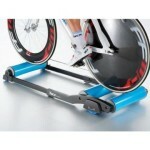 Rollers do take a bit of getting used to but are excellent for core training as well as pedal action. They are much less potentially boring than a stationary and are usually cheaper and more portable. As usual with cycling kit, once you have got the main piece of kit there are several accessories which – although not essential – will make training more bearable. This sits under the front wheel makes the bike level, if you think this isn’t needed try riding without it and see how odd it feels. As well as feeling odd, not having your front wheel raised slightly can lead to sore hands and aching knees if you’re not careful. 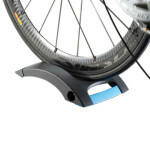 Example: Tacx Skyliner front wheel support. The heat and the amount of resistance put into a tyre on a turbo can cause it to disintegrate much quicker than road use. Manufacturers have developed specific indoor trainer tyres which are harder wearing but still offer grip for resistance efforts. Just don’t use them on the road! 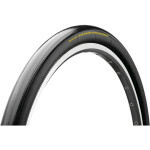 Example: Continental Ultra Sport Home Trainer tyre. One thing is certain, you are going to sweat on a turbo no matter what. A mat will not only prevent sweat from damaging surfaces but will also help deaden noise and vibration, keeping the turbo in one place. It will also stop any bike oils dripping on to floor surfaces as well. There are several ingeniously designed sweat guards which sit between the handlebars and seat. These are triangular shaped and prevent sweat from damaging your frame but not rub on your legs. Example: Elite Protec sweat net. Which turbo trainer should you buy? 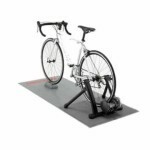 Basic training – For those looking to keep up their fitness a basic mag trainer will keep you spinning when the the weather is bad. They are relatively inexpensive, portable, easy to set up and if you can stretch to one with adjustable resistance you will have a trainer that will give you quality workouts for many years. Regular training – Those planning on using a turbo more often then a mag or fluid trainer with interactive features will make sessions more interesting. Some models feature the ability to ‘race’ other users or simulate iconic climbs. These are very good for motivation. Serious training – For the serious racer a turbo is a tool for specific sessions and will get lots of use so needs to be robust and reliable. A quality fluid or direct drive trainer will be best as they will give the most effective and consistent workouts. They tend to cost more and often don’t have any interactive features as the emphasis is on it as a tool rather than a toy. Tagged buyers guide, direct drive, elite, fan, Fitness, fluid, kurt kinetic, lemond, magnetic, riser block, sweat, tacx, trainer tyre, training, training mat, turbo trainer. Bookmark the permalink.